Re: What kind of spoiler is this? looks 22b ish to me..
Squillions of them on Fleabay ! I can't seem to find any on fleabay, thanks tidgy! 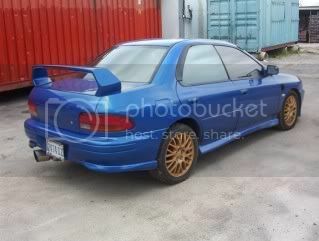 As Tidgy says looks like a reasonably priced copy (of a V5 STi wing to be precise) without the LED strip at the bottom. Not the best pic but you can see they are identical in overall shape aside form the bottom bit with the LED strip. Def not 22B as they are adjustable for starters. Still, I'm sure you, like me, never tire of looking at pics o my car. lol, thanks rikimaru. Well, yours looks real nice as well and I'll most likely end up getting the same one you have, but the one I posted looks a bit diff than the v5 sti wing without the led strip at the bottom, yours is wavier and rises towards the rear as that ones just straight up from the looks of it.